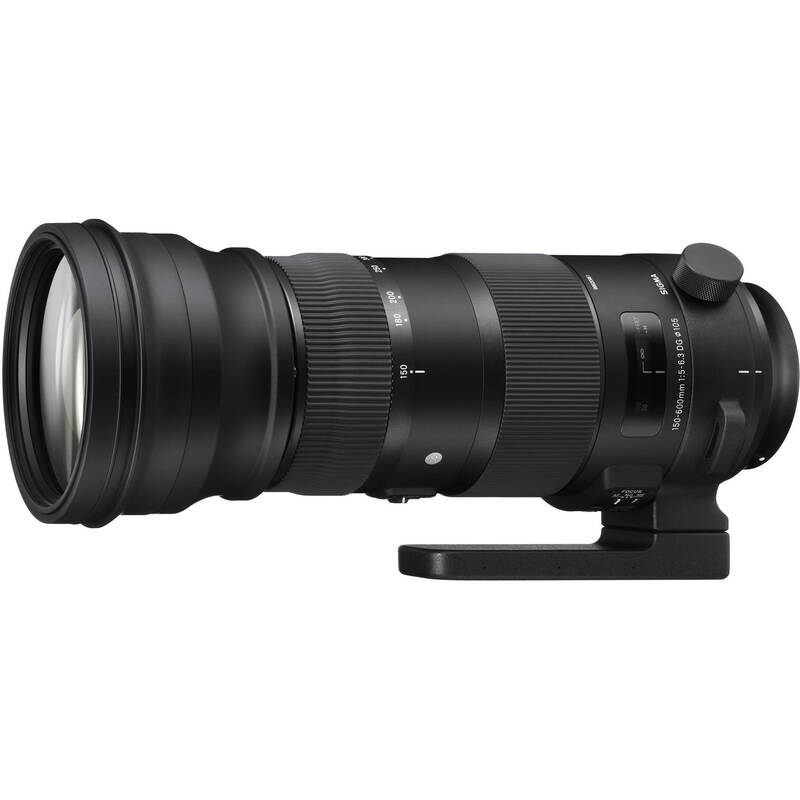 150-600mm f/5-6.3 DG OS HSM Sports Lens for Canon EF is rated 4.6 out of 5 by 70. Rated 5 out of 5 by PJB from The Best Lens I Ever Purchased The Sigma 150-600mm f/5-6.3 DG OS HSM Sports Lens is the most amazing lens that own; I use it with the Canon 80D. I purchased both a UV and Polarizing filter for this lens. It is durable, quiet, and takes very crisp images. When I first opened the box, I saw that it came with its own very nice carrying case. Although I have read reviews claiming that the case is bulky, I disagree - it is just the right size and protects the lens well. In fact, to my knowledge, there are not many cases out there that are large enough to fully protect the lens. Since it is built largely with metal, it will feel slightly heavier than other lenses, but it is definitely worth it. Rated 5 out of 5 by Johnbo of the North from Excellent Sigma Lens I have owned the Sigma 150-500. Shot a lot of pics with it and very few were sharp especially at 500mm. This lens is in a whole different class. Tack sharp super smooth operation. This must be due to the 2fld elements in the front. The switches are well placed and easy to manipulate even with a light glove on. I also wanted to try this lens because it is weather sealed which the 500mm was not. As for the weight, this lens is easily handheld. We here in Montana do not have a problem with the weight of this lens and that includes our women!!! Rated 4 out of 5 by Chirasak R. from Good Quality Lens - Worth the Money. This is my first non-Canon lens. I normally buy the lens from the same brand as my camera - Canon. However, when I was looking for 600mm (or 800mm) lens from Canon the price was more than 10K. So I did some research and I found this lens which I can afford. At first, I was worried about lens quality and resulting picture quality. After 3 days of testing the lens, I decided to keep it. Once I got used to the lens and how to use it, I determined that the picture quality is exceptional. I am glad that I bought this lens. Rated 5 out of 5 by Anonymous from Nice lens Used for wildlife and was able to handhold for some pretty good results. It does get heavy quick, however. With wildlife the window of opportunity is often short anyway. I also used a basic tripod with a ball head and it had good balance using the ring mount. AF was great, even at 600 and in some tricky low light situations. The lens will creep at high angles so there is a handy lock switch. I enjoy using this lens and at the price the results were impressive. Rated 4 out of 5 by JW Photo.US from Great lens, heavy, but great! I was debating between this and the Tamron version. After renting the Tamron last year for NAS Oceana Air Show I was pleased. This year I decided to try the Sigma Sport version for a air show in NJ, I was pleasantly surprised at the results of the Sigma compared to the Tamron. The image quality is great, not suburb like the 600mm Canon would be, but for the cost I feel the quality is great. Yes, this lens is heavy, I would recommend a tripod or monopod if using for long periods of time. At the Air Show in NJ, half the time I was hand holding shots and your arms get tired but if I was able to deal with it. I recently used the lens for a trip to a local zoo, hand held the whole day with a Black Rapid strap, wasn't too much of a hassle. Used mainly with a Canon 7D MarkII and 5D MarkIII. Rated 5 out of 5 by JLW Photos from It's a Winner Worked Great right out of the box and onto the camera. Using on a Canon 7D Mark II, this will replace my 150x500 Sigma (will still keep for a backup), the 150x600 Sport Lens is miles ahead of the pack. Great lens for the price and yes it is a bit heavy, but a monopod will help with that. Great for birds, wildlife and action photos. Looking forward to years of service with this lens. Yes, just tried it here at the store and it works flawlessly. Can I use this lens on my canon 7d ? I think it would be a great lens on a 7D. I'm a full frame Canon shooter, so I can't say IT's perfect on one! , but I don't see why it wouldn't be a very good sports and wildlife setup as long as you had enuff light. I do find myself shooting at ISOs around 1200 or so in order to have a fast enough shutter speed. If that produces sufficiently noise-free images on a 7d, then you'd be good to go. Autofocus is really good with this lens on my 5d mk3. It says, Made in Japan on it. It comes with a very nice case. Would this be compatible with a canon rebel t6? Yes this lens will be compatible with your camera and the effective 35mm equivalent would be 300mm-900mm. Will this work with the Sony a9 with the mc11 adapter? Yes, with the Sigman MC-11 adapter, this should work with the A9. Does this lens use internal zoom mechanism or external; in another words, does the lens extend or retract as it is being zoomed in or out? I live in south western BC Canada and would like to get this before the 1st week of April. Please, what is the ETA on for this lens? You should get it by then. I pre-ordered it when it was about to be released in September 19, 2014 and I was very pleased to have it in my hands in December 2. It is a wonderful piece of equipment. I also own the Tamron 150-600mm, both are good but I feel the Sigma is a stronger, wheather proof lense. Good luck with your choices!! !The sooner you order it the better. That is my experience with these lenses....they are so popular! !